Removals Company Sherborne, Woods Removals Sherborne Ltd.
Moving house is stress-free with Woods. We bring 140 years of experience with us to every job and the knowledge and skill we’ve acquired with time enables us to move people in a refined and well-planned manner so that peace of mind is never jeopardised. When you’re looking for a removals company in Sherborne, it makes perfect sense to opt for the longest-established. For well over a century, we’ve been moving people in and out of the area and we know its roads and backstreets intimately. Our BAR-trained movers, drivers and packers can have you settled and relaxed in your new home right from the first day. There’s no need to move in chaos when, with us, you can move in a state of pure calm. That’s what we offer, every time. We’ll start by sending out one of our estimators to visit you. Together, you’ll go through all the details of your move and, from there, a clear and straightforward quotation can be produced. You can decide which additional services you would like to use. We offer full packing and unpacking and our clients find that this bolt-on option makes all the difference. Our packers aren’t just anyone – they’re experienced and sensitive people who appreciate that your belongings matter to you. They come with exactly the right materials (including padding and specialist cardboard crates) so that vital items like paintings and mirrors can be properly looked after in transit. They know all about pianos and how to dismantle complex items of furniture. And they know exactly how to reassemble everything at the destination point. With their assistance, your new house will feel like a home from your very first night in it. This isn’t something you can rely on with other removal companies in Sherborne. Many people find that moving house leads to a need for storage. For example, if it’s a downsizing move, you may well have more belongings than you have space to put them. We offer storage in Sherborne that takes care of the problem, buying you as much time as you need so you can hold on to all your possessions while you work out what to do in the long term. 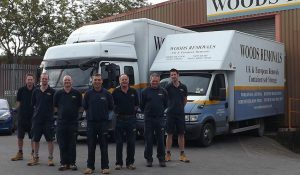 Whatever the unique elements of your move, Woods Removals is the way to a great moving experience.